A long time ago in a galaxy far, far away … Yoda was a Zen Master? The Dharma is the Buddhist tutelage that guides you throughout the truisms of life’s realisms. Basically, it’s a compass that directs you along the path towards the truth of reality, in other words, real life. Now combine that belief with George Lucas’s stories of the Hero’s Journey from Star Wars and ascend, all over again, across the stars of a galaxy far, far away in a whole new light. An enriching and enlightening take on the holy saga, from A New Hope and through the darkness of Revenge of the Sith; a periscope view from a spiritual standpoint. This is a lesson that came up a multitude of times throughout the duration of the book, reference after reference, and with, example after example – so in-depth, that I literally felt as if he was talking directly to me. As if, making sure I was paying attention. The conceptual focus of staying on target or in the spiritual sense of Buddhism, being attentive to the present moment, is a lot harder than it sounds. Sadly, my personal attention span is similar to that of our favorite gungan, Jar Jar Binks. Ok, let me clarify that a little. It’s not that I go about my daily activities with a frivolous manner of goofiness, not at all, but my mind has a tendency to drift-off in a nagging way. Reminding me, of everything else that needs tending to and all the other things that could be done, instead of what I’m already working on. In other words, my brain doesn’t seem to be equipped with a shutdown mode. … I am a slow learner. Probably why I find Anakin Skywalker to be the most relatable character in the Star Wars saga. No, not because he sarcastically referred to himself as such when dueling with Count Dooku, but because of who he is and where his life experiences led him. After all, he is the most human and makes the most mistakes throughout his self-suffering lifetime. Matthew Bortolin explains that Anakin, or Darth Vader is, more or less, a victim of his own demise. His thoughts dwelled upon all that he held dear, in which developed into attachments and, like a disease, ate away at his psyche – ultimately leading him to fear any impending loss. But like life itself, death is a natural part of it and that is the way of things … the way of the Force. Yoda, the all-knowing and all teaching of the living, breathing Force, tries to educate Luke on the continuum of its existence. Meaning, the Force never ends, therefore we always exist. Obviously not in the physical sense, luminous beings are we, not this crude matter. Basically everything has an extension of itself; a symbiotic relationship that enables us or the tree, for example, to live on, in some sense of a forever ever after. This is how Anakin was able to return to the light side and become one with the Force and in the afterlife. He witnessed an extension of himself, Luke, make a choice that he himself, could never do. That opened up his eyes and cracked the hardened exterior of that more machine now than man. Finally he allowed himself to let go of the fear, to accept it, to own it, and then vulnerably, sacrificing his own life for that of his son’s. His soul finds redemption and through that redemption, finds freedom; nirvana. The Dharma of Star Wars by Matthew Bortolin, published by Wisdom Publications MA and Distributed to the trade by Simon & Schuster – was released on November 11th, 2015 and is now available. 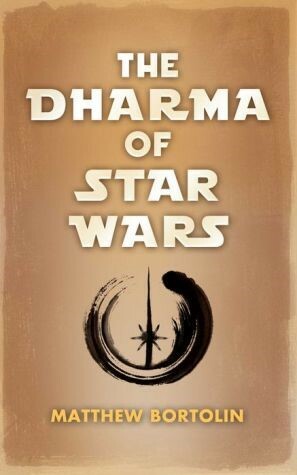 You can purchase your copy of The Dharma of Star Wars here. Thank you to Wisdom Publications for providing a copy of this book for review. Becca, what a wonderful review!